It is a difficult task for parents to select the best travel strollers for babies because there are varieties of styles and designs available, and too many brands, which makes it all the more confusing. As first-time parents, it is even more difficult to analyze what features to look for while choosing a stroller for the baby for traveling purposes. Going out shopping, walking, and jogging will never be the same after the baby is born; it will be a completely new world with new responsibilities. You will need to consider small things like the size of doorways, what terrains you would cross, navigation around stairs and much more. Below is a list of best-selling travel strollers for babies and their features to help you make the best choice. The Graco Fastaction Stroller is one of the best lightweight strollers for travel with innovative features like a one-second fold, multi-position reclining stroller seat along with an extra-large basket. It also includes a travel system which makes it more convenient for traveling – it includes the Snug Ride Click Connect 30 infant car seat. It is best suited for kids weighing up to 50 lbs. The Infant Car Seat-Rear-facing is for babies weighing 4-30 lbs & up to 32 inches tall. The sturdy and lightweight frame ensures portability along with a one-second fold system to facilitate moms-on-the-go. The Front swivel wheels, along with a suspension provides smooth functioning. A Graco Snug Ride Click Connect 30 infant car seat and a multi-positioning reclining seat along with a removable cushion enables easy washing. An adaptable 3 & 5-point harnesses keep the kid protected. 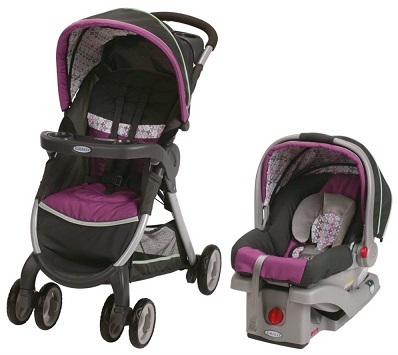 It is best suited for kids up to 50 lbs for secure and comfy strolling. The stroller the ultimate solution for making travel hassle-free. It has several groundbreaking features like trouble-free folding, flaps to keep a check on the baby, cup holders and an extra-large storage basket perfect for storing diaper bags and other baby items. The car seat insert is comfortable, and the canopy covers a large portion of the seat. The base has a level that indicates if it’s too angled during installation into the car. What’s more, all these features come at an extremely reasonable price. The Maxi Cosi Maxi Taxi Travel System Stroller Frame is the best choice if you want to make daily walks simple and hassle-free. The compact and sturdy structure comes with adapters for Maxi-Cosi Micro and Prezi infant car seats that facilitate an interchangeable travel arrangement. The easily foldable design along with the front swivel wheels ensures easy movement of the stroller through rough surfaces. The double foot brakes provide additional safety for inclined locations. This stroller is designed to make traveling trouble-free for both the baby and the mom. The structure frame is lightweight and has a simple design to facilitate traveling. Adapters from the Maxi-Cosi Micro and Prezi infant car seats create a convertible and compact travel arrangement. A 3-D sliding fold and front swivel wheels enable the stroller to move swiftly through difficult spaces, whereas the double foot brakes provide extra safety on slanting surfaces. Hassle-free folding and unfolding features enable storage inside the car closet. The stroller comes with a one-year warranty, and the JMPA-certified stroller frame fulfills ASTM standards of safety. The latest feature includes front swivel wheels with large foot pedals for effortless locking. The basket under the stroller seat gives enough storage space for baby items along with a cup holder and tray for smaller items. 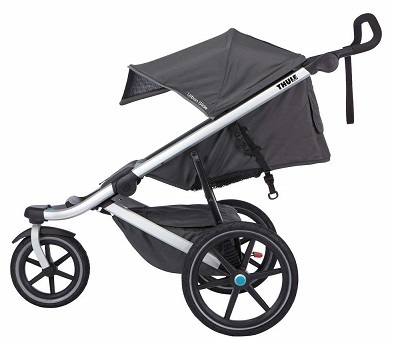 The Maxi Cosi Maxi Taxi Travel System Stroller Frame is a perfect choice to keep babies comfortable and safe in a stroller that offers a smooth ride, is lightweight, easy to fold and unfold. The best part is that the Maxi Cosi adapters are well-suited with Cybex car seats. The stroller stands up straight after folding, and the compact structure also requires minimal storage space. It also fulfills the safety standards of ASTM and is JPMA certified. Maxi-Cosi is a leading brand with years of experience, so parents and families can stay assured of the quality. If you are the mother of a new-born baby, then the Basrey stroller is the solution. It has all the requirements – new safety features like Brakes with One step, a Swivel and lockable front wheel, and a five-point safety belt to keep the baby safe and secure. The large storage basket and cup holders provide enough storage space for the child’s items. The adjustable footrest cushion keeps the baby comfortable and the one-hand folding facilitates keeps their moms on the go. The red reflective sidebars and the multi-functional double pushchair provide added safety and higher visibility at night. The single button collapse provides instant folding, the double brakes rear wheel along with the 360° swivel lockable front wheel enables a smooth push along with safety. The adjustable backrest and front double pram is suitable for kids in the age range of 6-36 months and can stand the weight of 33 lbs so that that baby can lie in it comfortably. 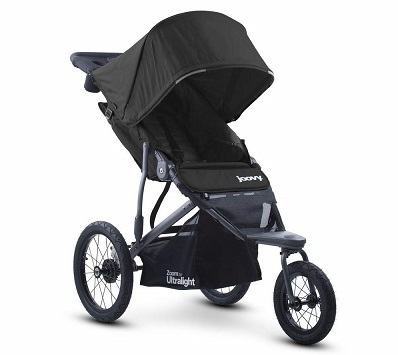 The detachable top canopy and removable handle help protect the baby from UV Rays and direct heat from the sun. The features that make the stroller unique are that it’s not very heavy and the front and back seats are adjustable. The Stroller is easy to arrange and operate. It is the best for kids of up to 6 months and 3 years. The storage basket has enough space for the kid’s items, which adds on to the convenience. All such features make it one of the best light strollers for travel. The Foundation Quad Sports 4-Passenger Stroller is one of the most famous multi-child strollers in the market. It has great features like an easy to clean fabric, canopies for UV Rays and sun protection and extra spacious storage baskets. All the seats have safety features like the adjustable 5-point harness, a safe brake system which reacts when stroller handle is released and a rubberized shock absorbing foam for a comfortable ride. The stroller has a stadium design for maximum child visibility. The convertible stroller is available in a removable and reversible sleeping bassinet 2 in 1 stroller design. It had a double brake rear wheel and a 360° swivel lockable front wheel for smooth gliding. 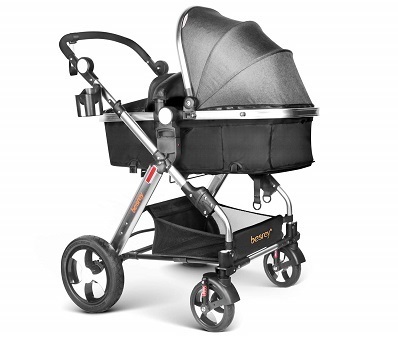 A collapsible high view besrey stroller offers suitable height and air circulation for the baby. The 5 point safety harness along with reflective strips glow during night travel. This is the perfect stroller to provide relief to every mother an child while traveling, with intelligent features like a four-seat recline for an optimal nap, enough leg room and plenty of shade by the visor. The stroller allows easy movement over uneven concrete surfaces and curbs due to the 360° swivel lockable front wheel. It is the best stroller in this price range. Maxi Cosi is a perfect choice if one wants to feel free to go wherever one wants to with the best travel stroller for a toddler. It’s compact, stylish, and lightweight. The five different modes for strolling guarantee that the baby is resting comfortably while traveling. It can be effortlessly converted from a travel system to a carriage to a stroller. Moms can rest assured knowing that their baby is safe and secured. It is one of the lightest infant car seats in the Maxi Cosi range that comes along with a stay-in-car base and a stylish stroller. The car seat carrier facilitates comfortable transfer from vehicle to stroller along with a reversible seat and a carriage that can face the front and the rear. Adjustable settings allow a smooth ride, along with a seat that stretches out effortlessly. Easy clean fabric along with padded seat and the self-wicking fabric keeps the baby dry. 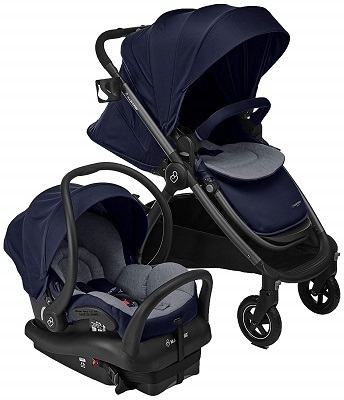 Its travel system includes extendable canopy, lockable swivel wheels, a one-click latch, and storage basket. These features make it perfect for trips in cars or taxis. What this stroller extraordinary is that it is specially designed by car safety experts to give your child advanced protection to make rides safe and comfortable. The innovative features include a reversible carriage mode, a reversible seat mode, height adjustable handles, lockable swivel wheels, and many more innovative features. 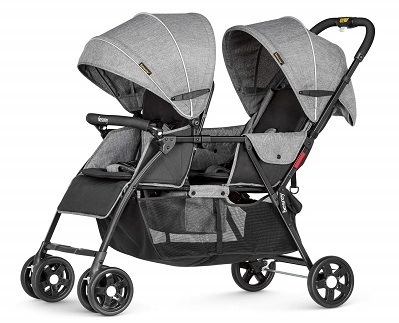 This Jogging Stroller has several effective features – the front wheel has a trouble free gliding structure and locks in perfectly for jogging, it transforms into a small stroller for travel with smart car seat adapter feature (sold separately), has comfy padded seats that go flat for on-the-go naps has a one-handed compact fold. It provides utmost comfort and safety for your baby. The Swivel Front Wheel locks in for jogging and facilitates smooth gliding. The adjustable multi-position canopy travel umbrella stroller provides weather protection. A padded adjustable handlebar and rear suspension ensure a comfortable and smooth ride. It has single-hand fold and large storage compartments, reclining seats for on-the-go naps, and a magnetic Peek-a-boo window to keep an eye on the kids. It really justifies its name – it feels extremely smooth while gliding. It runs like a dream even on dirt and gravel. The easily switchable swivel wheels and the one-hand fold storage, storage compartments and many innovative features are available at affordable prices. 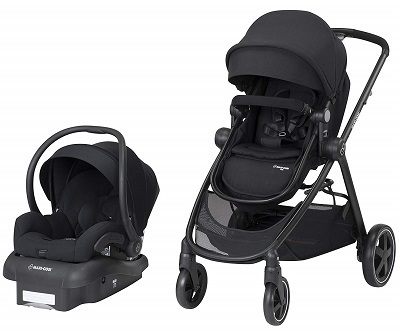 Maxi Cosi Zelia 5-in-1 includes all the safety and comfort features to take your child wherever you want to. It includes the most lightweight infant car seat along with a stay-in-car base and a stylish easy to glide stroller system. It is packed with features like a self-wicking fabric, lockable swivel wheels, an extendable canopy, a one-click latch system and many other new and innovative features to keep the baby safe and comfy. The lightweight infant car seat is available along with a stylish and comfortable stay-in-car base and easy to glide stroller. It has a reversible seat carrier with a rear facing feature which also facilitates easy transfer from car to stroller. 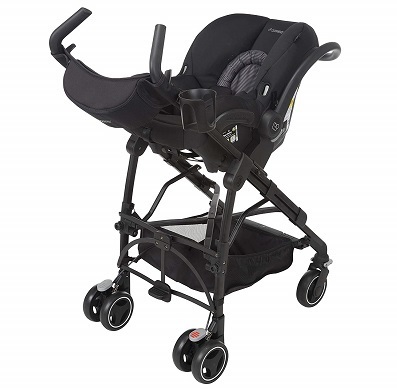 Adjustable stroller settings guarantee a smooth ride and comfort while on-the-go. It has an easy clean premium self-wicking fabric to keep the baby dry and padded on the stroller for comfort. It is packed with travel-friendly features like lockable swivel wheels, a large storage basket, an extendable canopy, one-click latch system and many more features. The Zoom 360 Ultra-light is the latest addition model to the Joovy jogging range. It is crafted with aircraft aluminum that makes the structure lightweight, and the updated design is stronger, simpler and looks much better. The suspension smoothes out the bumps and offers a comfortable ride. The over-sized canopy provides better weather protection, plenty of storage options, a compact fold design and many more features that ensure safety and comfort for your little ones. It has extra broad seats that are at a great height to offer great visibility along with a multi-position seat recline and quick release 16” back wheels along with 12.5” swivel front wheels that lock instantly. It includes a running leash, a parent organizer and a tire pump. The aluminum frame offers strength and shock absorbing power. It has an intelligent design that folds and unfold easily. It is an amazing jogging stroller that is very light, has great suspension and easy and smooth to glide. The large canopy offers great sun and rain protection. The stroller has been designed using great quality material that makes the structure sturdy. Your child is precious to you, and you need to select a stroller that will keep your baby safe and comfortable – but in a cost-effective way. The stroller must-have some essential features – it should be lightweight, have modern styling and have suitable safety features; but that doesn’t mean that you have to spend a huge amount for a good baby travel stroller It’s all about analyzing what your baby will require. Strollers are also a great option for a gift on a baby shower. Before you select a stroller, to use the guide above to select the best stroller for your baby at an affordable price.